Back in the ’70s, the seeds of pre-Internet e-commerce were sown with the help of EFT and EDI technologies. Relatively few people used these technologies. None of them could have predicted how e-commerce would grow over the following half-century. The wider adoption of credit cards changed the game in the ’80s and ’90s, laying a foundation for the almost-cashless world we know today. It was in the ’90s and ’00s, however, that the true change began. The WWW boom gave rise to companies such as Amazon, eBay and Alibaba. Two decades later, those companies still dominate the online shopping sphere. Whether those e-commerce giants will continue to dominate remains, however, up for debate. Each has been stained by a range of controversial issues, prompting many to call for the next stage in the evolution of e-commerce: decentralization. Many people, of course, believe blockchain is the key to decentralizing e-commerce. To see how realistic this is, let’s take a look at the most pressing issues blockchain can solve. You might be happy to put your trust in Amazon as an online store. But remember, Amazon is much more than that. In July 2016, Amazon CEO Jeff Bezos joined the Pentagon Defense Advisory Board, led by former Google CEO Eric Schmidt. The tech giant already services the cloud system used by U.S. intelligence agencies, and it looks set to sign a $10bn contract with the Pentagon. Amazon has also entered our homes with its virtual assistant, Alexa. Spontaneous laughter, reported by users, is not the only creepy thing about Alexa. There are serious privacy concerns surrounding personal information captured by the virtual assistant, which listens to your conversations by default. It’s obvious why you wouldn’t want your primary online marketplace to have access to all this information. That’s why we need a trustless e-commerce platform more urgently than ever. Luckily, projects such as Safex are decentralizing the ownership and governance of platforms. This will make the shopping trustless. Privacy is our given right, and we shouldn’t have to compromise it for anyone. According to recent reports, there’s a black market for information harvested from Amazon users. Amazon workers have been unlawfully selling internal sales metrics, reviewers’ email addresses, and sensitive confidential information to online stores. That information can reportedly fetch anything from $80 to $2,000. That’s a huge temptation for many lower-level Amazon workers who earn relatively low wages. The right to privacy is an integral part of our civil liberties and is critical to the freedom of our society. Privacy is not something we should be ashamed of; it’s vital to ensuring our safety. We don’t have to sacrifice our safety to shop online. Blockchain allows us to have the best of both worlds. Safex is using this technology to offer an e-commerce solution featuring Ring signatures. That means that Safex platform doesn’t hold any data about users’ balances or spending habits. You can shop without worrying about criminals targeting your account or your personal information. There are tens of thousands of counterfeited items sold as originals on e-commerce platforms. That makes it easy for sellers to mislead customers with fake reviews. Companies like Apple view this as a serious issue and are fighting Amazon with lawsuits. Several IoT blockchain projects are also working to prevent counterfeiting. They’re placing small sensors on shipping containers as well as products, such as luxury bags, wine bottles, and medicines in order to track them from the origin to the end user. By scanning a QR code with your phone, you can check your order’s exact location and condition. This information also includes the conditions in which the product was kept during storage and transport, such as humidity, temperature, and vibration. Inappropriate storage and transport may have a significant impact on the price, quality, and condition of products. With the help of IoT blockchain-based solutions, it’s possible to provide a trustable product while also preventing counterfeiting. If you return products too often, Amazon might ban you, without the possibility of opening a new account. There is no clarification about the exact number of returned orders that would get you banned. As well as banning buyers, eBay and Amazon are also banning sellers. In fact, Amazon recently banned Chromecast and Apple from selling TVs on its platform. The main problem is that Amazon produces its own range of goods; competing products don’t stand a chance. As Amazon grows and diversifies its businesses, this problem will grow as well. Uncensorable decentralized platforms are immune to this. People spend ages building their reputation as trustable sellers and buyers; they shouldn’t lose that in one day over unclear policies and conflict of interest. Large sellers, such as Apple, may survive this — albeit with huge losses nevertheless — but anti-competitive bans mean certain death for smaller sellers. No centralized platform is truly global if it discriminates and bans users from certain countries. Some also completely forbid people from partly-sanctioned countries from buying and selling anything, even if those goods aren’t embargoed. Payments are the final major issue. PayPal doesn’t work in 20 countries. Banks are even worse in this regard. There’s one viable way to solve all of these problems: using cryptocurrencies and blockchain. Online shopping has grown significantly over the past 50 years. But to make trade truly global and inclusive, blockchain and cryptocurrencies are the next steps in the evolution of e-commerce. Blockchain technology making online shopping even better. People will become even lazier to step out of their houses. Blockchain technology is slowly creeping its way into online shopping. It's best to have consumer safety and privacy protected. 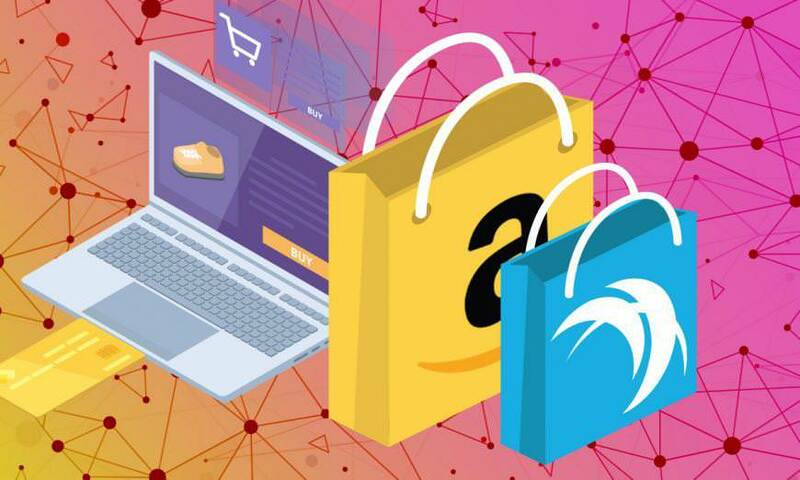 Online shopping is becoming more and more common now, so all the more there should be efforts in reducing and preventing private data from being simply shared. @bell Yeah, it is. Since blockchain technology promotes transparency and privacy protection, it should be a good step.